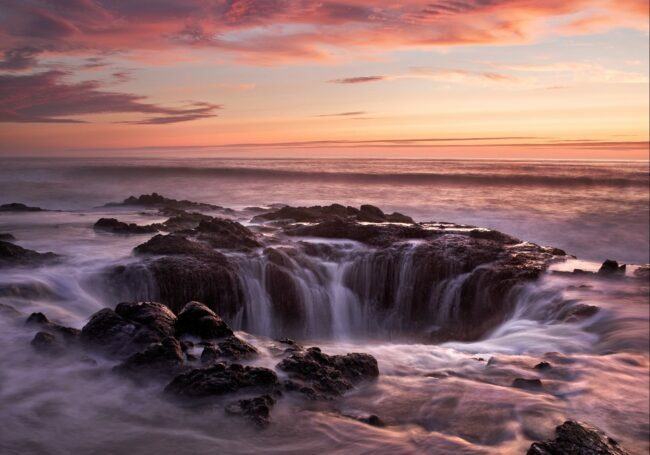 Directions: Thor’s Well is located in the Cape Perpetua region of the Oregon coastline. Yachats is the closest town and Florence is a bit further down South. From Yachats, you can get to Thor’s Well within 10 minutes by driving south down the 101 highway. There is no clear indication from the main road other than an overlook point where you can park your car soon after passing the Cape Perpetua visitor center. You can then climb down to the rocky coastline. The area around Thor’s Well is quite impressive. Right next to Thor’s Well is another interesting sight, the Spouting Horn. The rest of the coastline is craggy and it is possible to use the craggy rocks and the effervescent ocean for any number of photo ops. Thor’s Well itself is a hole in the coastline into which the ocean water seeps in. You do have to wait for the tides to rise though before you can see this happening. It is not a good idea to get too close because, every now and then, the water pressure builds up from seepage below and the water rushes out of the hole at great pressure. Falling on these craggy rocks is not fun and slipping with expensive equipment, much less so. However, it’s not really as dangerous as some online forums made it out to be before I went there. Use common sense and waterproof boots (or even better, open toed rubber shoes with good grip) because your feet will most likely get wet. The hole itself is not terribly big but seeing the water seep in from all around is quite an incredibly rewarding event to witness. The evenings are generally best though you often end up shooting directly at the sun. The summers in the Pacific Northwest are generally the safest if you are travelling there because the weather can be notoriously uncooperative and foggy. A wide lens is great though you can probably make do with a full frame 21-24mm equivalent lens and not go wider. You will get wet so wear waterproof boots with good grip. A rain jacket is useful too for whenever the pressure releases the water from within the hole. Be prepared to turn away/ cover your camera/ lens when the water spouts out. I had to wipe the lens clean on several occasions so keep some dry microfiber cloth handy. The evenings are great to catch the last light. Since Thor’s Well sits behind a big hill, it generally doesn’t catch any morning light. Does the water overflowing the hole happen during the high tide?